This is a rare study for the central male figure of the middle panel of a triptych, painted thirteen years after the drawing. 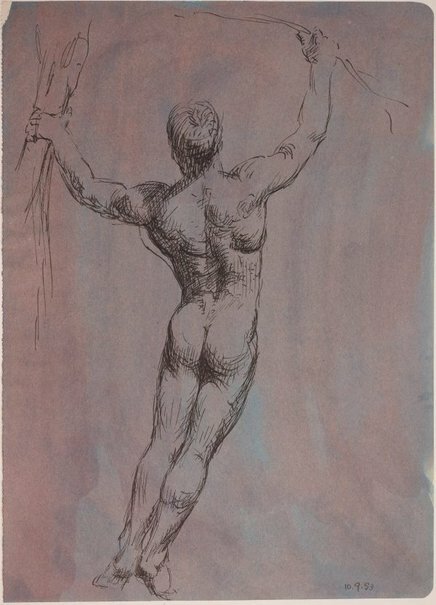 Male figures in Gleeson's paintings from the 1950s and 60s were generally based on photographs in physical culture magazines, rather than on studies from life. Hendrik Kolenberg and Anne Ryan, 'James Gleeson: drawings for paintings', Art Gallery of New South Wales, 2003, pg. 55. Not signed. Dated l.r., pen and black ink "10.9.53".